Last Saturday the World economic forum kids workshop was held at Mixed Reality Lab, CUTE Center in National University of Singapore. It was nice to see kids are playing with papers, balloons, and prototyping. Most of the generated ideas are related to environmental pollution and the natural resources, except one group concerned on Internet security and the associated threats. After the workshop had nice sushi from professor. Yesterday night MXR and the MIME teams had a great party in a Japanese Kuishin Bo Japanese Buffet Restaurant at Suntec city. Had sooo many Japanese food for the first time!!! Mr. Brad Greenspan, the founder of MySpace.com visited the Mixed Reality Lab today. He was impressed with the researches and asked many questions and gave good comments. Finally submitted to KAIST YoungCT conference paper on Poetry Mix-up. I hope it will be a success since this year's theme is "Engaging Culture and Technology". It was a good inspirational workshop for them as well as us at the end!! It has been almost 2 months since my last post. First started with the president's visit to Mixed Reality lab and the CUTE Center opening ceremony. Then I went to Athens, Greece for ACE 2009 conference from 29th to 31st of October. See my experience in Athens from this URL. There I presented the Poetry Mix-up short paper and demo the system. Many interesting feedback and comments. I have gotten a Poken device from the barCamp SG 4 event held in last weekend. It was a nice event with lots of knowledgeable discussions. I conducted a session on "Poetry for young generation". Hmmm, From several years I have been thinking of starting a new blog. I found a great name as related to my research as well in my graduate studies, so I ended up with http://tasteoverip.com, and just bought the domain name from the Google itself. Readers are welcome on board to my blog and most of the times I will be writing the things related to my researches and things during my studies here in Singapore. Bit about me: I m Nimesha Ranasinghe, originally from Sri Lanka and doing my graduate studies in National University of Singapore at mixed reality lab. My research interests are mainly focuses on Interactive Media and Interactive communication. In addition, i have been interesting on Mixed and Augmented reality, Mobile and Embedded Systems, and Human Computer Interaction as well. 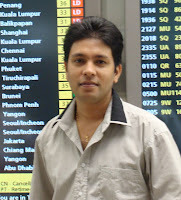 I have a Computer Science background and graduated from Faculty of Information Technology, University of Moratuwa, Sri Lanka. Hope you ll enjoy my postings !!! !